Thanks frenzykitty and Mandle for the kind words Check out the updates above. This kind of stuff make me want to keep polishing the game forever! EEK! I'm SO EFFING EXCITED! Around 0:55, that kind of "space tube" entering interdimensional/hyperspace/whatnot reminds me a lot of Dune. Immediate dream. Sci-fi adventures are the best and this one looks very promising! Love the idea of randomizing events and puzzles and emphazis on player choice. Good luck with the production. Added several alternative solutions for puzzles, some of the alternative solutions require physical and timing skills. 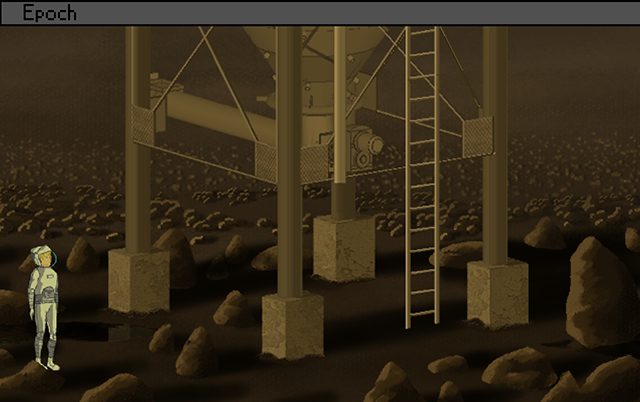 Spending a lot of time adding background details for immersion. Recording and editing my own sound effects for the game. Created a few 2D animated cut-scenes. Wow, this really does look great. Keep up the good work. Oh man! Great Style. Hat tip! Been creating a lot of sounds effects by recording different sounds from clangs to water pouring sounds then editing them. Adding details to backgrounds. Animating 2D cut scenes. Composed 4 music tracks. Wrote 1KLOC for alternative puzzles solutions. Dialogs: LOTS OF DIALOGS. Carter had witnessed a weird phenomena. More investigation and documentation are required. Alex and Aziz are a little worried specially that Carter hasn't been 'well' lately. This is looking really AMAZING! Those cutscenes are really well done and the characters animations couldn't be better! Kinda reminds me of The Dig, especially the first part where you move around that asteroid. Just one thing that could be improved: Select a more space-y font that fits better to the theme and get rid of the default buttons for the inventory. Wow! This looks really awesome. Love the cutscene. And nice voiceacting Tabata and Captain D! Lt. Smash I will consider your suggestion regarding the font. I'm not sure what you meant by "get rid of the default buttons for the inventory" though. could you please shed some light on that? BTW the trailers are really cool So much detail! I like how the lips fit very well to the spoken words! And nice voiceacting Tabata and Captain D!